Yesterday the first major traded happened when the Columbus Blue Jackets traded disgruntled center Jeff Carter to the goal-starving Los Angeles Kings in exchange for blue liner Jack Johnson and a 1st round draft pick in 2012 or 2013. You can find part 1 here. Once again the Edmonton Oilers will definitely be sellers this season as their thin defensive corpse was not good enough to support their budding stars Hall, Eberle and Nugent-Hopkins. With Ales Hemsky about to re-sign with the team (reportedly two year at $5MM/year), Nikolai Khabibulin currently injured and coming with a hefty contract and Andy Sutton previously signing a one-year extension with the team, the Oilers don’t have many assets to trade before the deadline. The team is shopping Eric Belanger, who’s been a major disappointment this season, but he’s not very appealing. An impending UFA, Ryan Smyth would certainly interest a lot of teams looking for scoring and leadership, but he owns a no-movement clause and I don’t believe he would waive it after coming back to Edmonton. The Florida Panthers are currently vying for a playoffs spot, battling both the Washington Capitals and the Winnipeg Jets for the division lead. The team would like to get rid of unproductive forwards Marco Sturm and Sean Bergenheim to find the missing pieces to contend in the East. As for UFA blue liner Jason Garrison, he is drawing a lot of interest around the league because of his very affordable salary ($650,000) and offensive touch (13 goals), but the team would be foolish not to re-sign him. 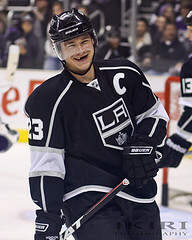 Dustin Brown is not on the trade market contrary to recent rumors (Photo by Chassen Ikiri). The Los Angeles Kings made their major move yesterday when they acquired Mike Richards’ best friend Jeff Carter from Columbus in exchange for puck-moving defenseman Jack Johnson. Dustin Penner, who’s been a frequent healthy scratch, is still being shopped around the league, as the impending UFA is having a tough year and was victim of a pancake injury earlier this season. Contrary to some rumors, captain Dustin Bown is not available as per GM Dean Lombardi. While young goalie Jonathan Bernier would be a viable option for teams looking for a quality netminder (Lightning and Jackets among others), the Kings won’t likely trade him before the draft as they prefer to keep as an insurance policy for the playoffs. Also, the Kings have announced today that they have extended rearguard Willie Mitchell to a two-year deal worth $7MM. Ravaged by injuries up front, the Minnesota Wild are falling down the standings faster than Keanu Reeves’ career going 3-5-2 in the past ten games. With injuries to key players like Mikko Koivu, Pierre-Marc Bouchard and Guillaume Latendresse, the team desperately need offensive help before it’s too late. The team is currently dangling UFA goalie Josh Harding as a trade bait to acquire a top-six forward. Possible rentals for the Wild are Wojtek Wolski, Andrei Kostitsyn and Brad Boyes. The team could also trade veteran defensemen Greg Zanon (UFA) and Marek Zidlicky to get much-needed scoring punch. After trading veteran Hal Gill to the Nashville Predators in exchange for a 2nd round choice and forward Blake Geoffrion, the Montreal Canadiens are now last in the Eastern Conference eight points out of the 8th spot. I analysed the Habs’ best trade options in an article last month and with Gill gone, the most likely candidate to be trade is now AK46. The Nashville Predators are doing all they can to re-sign defenseman Ryan Suter before the deadline and if they can’t re-sign he might become available, but the price will be hefty. After the acquisition of Hal Gill, the Predators might be willing to sacrifice a young defenseman like Jon Blum or Ryan Ellis to add top-six forward to an already potent line-up. Ant that player could very well be Sergei Kostitsyn‘s older brother Andrei Kostitsyn. After acquiring forward Alexei Ponikarovsky last month and with the impending return of forward Travis Zajac from a recurring Achilles heel injury, the New Jersey Devils are set up front. However, with blue liner Henrik Tallinder out six to eight weeks with a blod clot in his left leg and Adam Larsson still out with a bruised lower-back following a PK Subban body-check, the Devils will certainly look to add a depth defenseman such as Jaroslav Spacek, Chris Campoli or Roman Hamrlik before the deadline. As for impending UFA Zach Parise, he will not be dealt this season, but look for GM Lou Lamoriello to extend him before July 1st. If Parise wants to test free-agent market, then Lamoriello will trade him and see what hefty return he can get for the nifty Parise. While both Martin Brodeur and Johan Hedberg will be UFAs at season’s end, don’t expect them to be dealt as they both want to re-sign in New Jersey. With the New York Islanders eight points out of a playoff spot, it is likely that GM Garth Snow will be a seller before the trade deadline. Players that could be moved out include goalie Evgeni Nabokov even if there are rumors about him re-signing with the team after Rick Dipietro‘s career ending injury. Also, veteran rearguards Milan Jurcina, Mike Mottau, Steve Staios and Mark Eaton who are all slated to become UFAs at season’s end could be dealt to contenders. Yet, the most prized trading bait might be Pierre-Alexandre Parenteau who’s making an affordable $1,250,000 this season and has 54 points in 60 games this year. PAP will be one of the top targets come deadline day and the price will most likely be a 1st rounder. Currently leading the Eastern Conference with 81 points, the New York Rangers will definitely be buyers this season, but don’t expect a major overhaul in the Big Apple. GM Glen Sather has already managed to trade under-performing tweener Erik Christensen to the Wild and is still looking to unload Wojtek Wolski. While the Rags are certainly interested in sniper Rick Nash and have the assets to acquire him, I really don’t think they will trade for him in the next 72 hours. Look for the Blue Shirts to tweak their line-up and add a depth forward such as Daniel Winnik or Adam Hall and a veteran defenseman such as Scott Hannan or Jaroslav Spacek to mentor their young blue liners. Currently ranked 7th in the Eastern Conference, the biggest surprise in the NHL this season, the Ottawa Senators, will certainly be buyers. Bryan Murray will not mortgage the future of the team to make a major acquisition, but look for the Sens to add a top-nine forward like David Jones or Eric Belanger to a young core led by the likes of Spezza, Alfredsson and Michalek. Murray could also try to add a insurance policy in net following Craig Anderson‘s injury (finger cut) that he sustained against the Capitals on Wednesday. San Jose Sharks’ Antero Niittymaki could be a cheap option in goal.